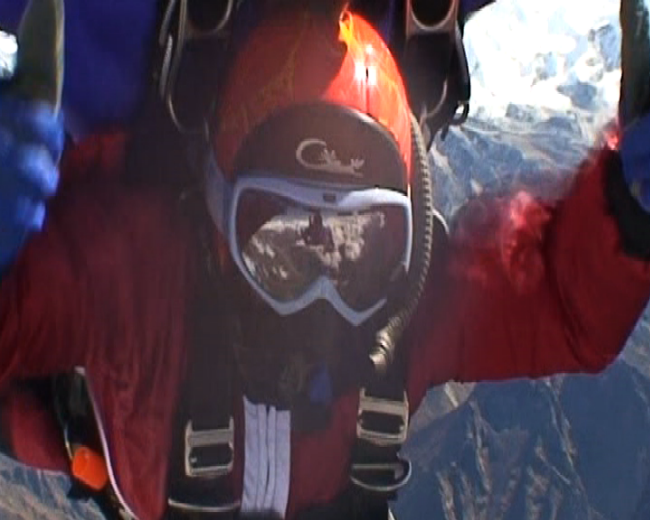 Namira Salim, a Pakistani National became the first Asian to Skydive Everest as part of the “First Everest Skydive 2008.” Not only did a select few dive from an altitude above Mount Everest , 29,500 feet, they also made history as the first jumpers ever to skydive from the roof of the world. Namira skydived tandem on 11th October after much waiting due to challenging weather conditions at 12,350 feet in Shyangboche, the highest drop zone at the world and normally the average altitude at which most skydives begin. This was her first skydive. “We almost always had a small weather window from around 6am to 10am due to the late monsoon in Nepal. This caused unexpected delays in our jump programme” said Namira. Taking off in the Swiss Turbine P3 Pilatus Porter, she jumped in extreme cold at 29,480 feet looking onto the summit of Everest. To her surprise, during the free fall, Namira felt suspended in thin air due to lack of relative motion as she was captured on video for family and friends by camera flyer Wendy Smith. After approximately one minute of free fall at the speed of 158 mph, her parachute, three times the normal size, was deployed at 18,000 feet. Being a high altitude jump, where one experiences 40% less oxygen, Namira was equipped with an oxygen system, protective googles, gloves, helmet and a thermal jumpsuit which read “Peace Making with Nation Souls” the theme of her universal peace flag. 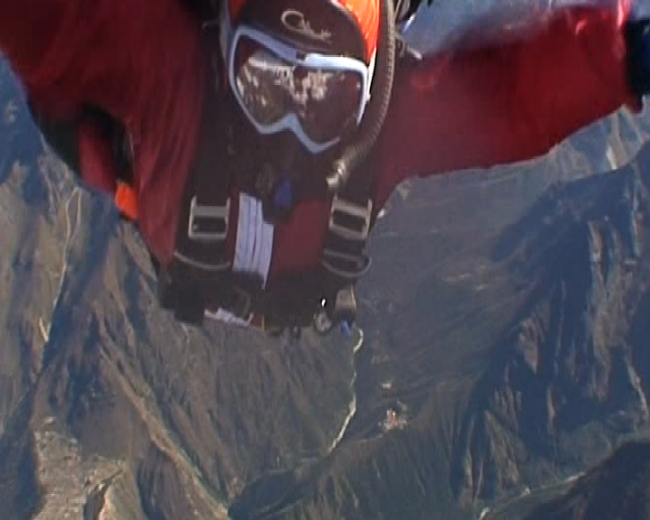 The landing was smooth as she softly touched down at the Shyangboche drop zone contending with winds of around 150-200 mph that could have blown her off course. With the best of jump equipment, pilots, skydivers, tandem masters and camera flyers gathered for this amazing adventure, one was sure of safe operations. The Everest Parachuting Operations and Drop Zone Control fell under the expertise of Dave Wood, a qualified US Military High Altitude Tandem Master and Instructor of Military Freefall Oxygen Systems, with 7000 jumps to his credit. The Dual Hawk Tandem System, equipped with Set-400 Main Parachute, Master 425 Reserve Parachute an Airtec Miitary Cyres was provided by Tom Noonan, Director Strong Enterprises. After arrival in Kathmandu the skydivers were flown to Lukla in Twin Otters, where the jump programme preceded 10 days of challenging trekking in the Sagarmatha National Park for acclimatization and high altitude training. Everyday was an early start followed by trekking for 6-8 hours up and down steep and gentle trails along scenic mountains and the milky white ‘Dhud Khosi Valley’ making way through small villages that housed lodges and tea houses. “While our porters and yaks would be far ahead leading us to our next destination, our Sherpa support team would cook for us and our wonderful guide ‘Billi’ would keep our group together” recalls Namira. “I was greatly touched by the life of the sherpas who seem nothing of carrying un-imaginable loads through zigzag paths amid the delicate mountain environment” She added. The trek, which started at 9,100 feet in Lukla went as high as 13,500 feet. I convey my heart felt gratitude to my parents and loved ones for their unconditional support. I am proud to have touched Everest, the third pole of the world in my own unique way.“ She added. 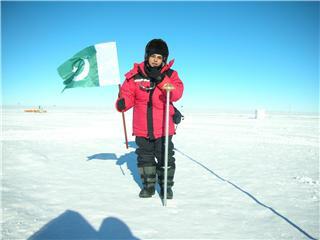 Namira Salim was the first Pakistani at the North Pole in 2007 and at the South Pole in 2008. 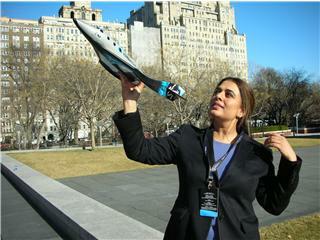 She is also set to become the first Pakistani in space aboard Richard Branson’s Virgin Galactic. RAWALPINDI: President Pervez Musharraf has lauded the services of Namira Salim, first Pakistani astronaut, saying that she is symbol of the abilities and capabilities of Pakistani women to perform well in any field of endeavour. The President was talking to Namira Salim when she called on him here on Wednesday. The President congratulated her on qualifying as first Pakistani astronaut and on hoisting the National Flag at the South Pole, which raised the image of Pakistan. During the meeting, Namira also presented to the President her Sub-Orbital Spaceflight Training Certificate which she recently completed at the NASTAR centre in the United States which makes her the only Pakistani to have qualified to go to space. London, JAN 29 -- President Pervez Musharraf was presented with Pakistan's national flag flown on the North and South Poles by a Namira Salim, known to most as the first Pakistani Astronaut. The presentation took place in London before the President returned to Pakistan from Britain. Ms. Salim was introduced to the President at a press conference by Pakistan High Commissioner (ambassador) to UK Dr. Maleeha Lodhi, who described the adventurer as an extraordinary person, who became the first Pakistani to traverse both North and South Poles. Dr. Lodhi added that Ms. Salim is also training to become the first Pakistani to travel into space under a project initiated by a leading British entrepreneur Sir Richard Branson. 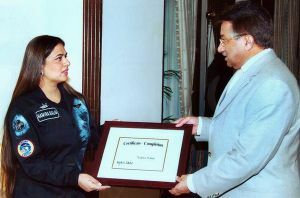 Musharraf praised the exploits of Ms. Salim and accepting the flag said he would put it in an important place in his office. Namira Salim, first Pakistani at the South Pole hoists the National flag at 90 degrees South on 10th January, 2008. 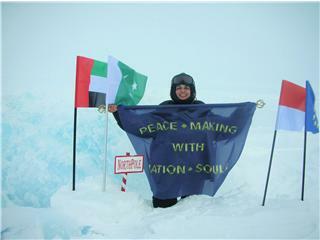 Namira Salim, the first Pakistani at the North Pole hoists a universal peace flag "Peace Making with Nation Souls" at the pinnacle of the world and the Pakistani flag, along with the UAE, Monaco flags [EU] her adopted countries on 21st April, 2007 as Pakistan's Honourary Ambassador of Tourism. DUBAI — After her recent South Pole expedition, Dubai-based Namira Salim got the first glimpse of the spacecraft that would hopefully take her to space next year. Namira, who is likely to be the first Asian woman space tourist when she takes a Virgin Galactic space tourism flight, witnessed the public unveiling of SpaceShipTwo and MotherShipEve, which will carry her to sub-orbital space. Namira, alongside tycoon Richard Branson, Chairman Virgin Group, was part of the hi-profile event in New York. Also present was Burt Rutan, the developer of the two crafts who unveiled together with Branson, the scaled models of the spaceship and mothership which will carry Namira to space . “It is a very exciting stage in the development of private spaceflight, as we are a big step closer to the actual launch,” said Namira from New York. “The most thrilling is yet to come this summer when the actual MotherShipTwo will be rolled out. This is when the test flights begin and we are all looking forward to this the most,” she added. She was recently nominated for the ‘Emirates Woman of the Year Award 2008’ under the sports category for her selection as the first woman from the UAE to go to space. Namira is also the first woman from the UAE to have reached the North and South Poles in 2007 and 2008, respectively. Namira, who was selected out of 144,000 applicants is one of the 100 founders in the Virgin Galactic club who would be the first Pakistani and the first female from the UAE to go on a private space tourism flight. 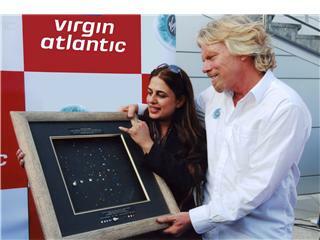 Namira Salim, UAE's first Virgin Galactic Founder Astronaut at a press launch in Dubai, as she presents Sir Richard Branson with one of her creations --an astronomically accurate night sky representing the moment when the world's first private space ship, SS1 made it to space. Since this flight was during the day, the skyscape in the art was only visible from the window of the space ship when it broke the earth's orbit. 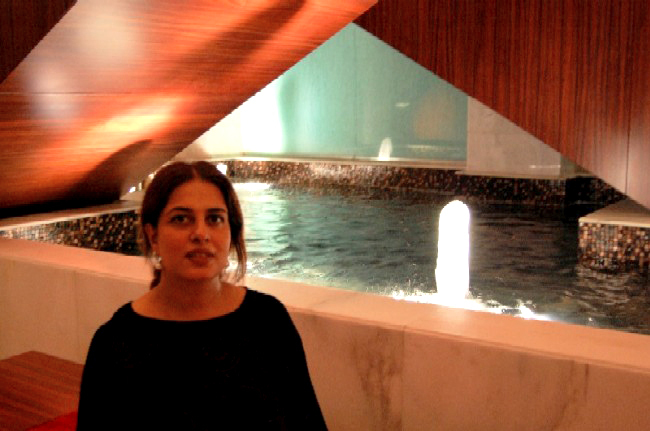 Namira Salim, a Pakistani artist, and known to most as the first female to go to space from Asia and the Middle East is a prominent personality based between Dubai and the Principality of Monaco since 1997. With a Masters degree in International Affairs from Columbia University, Namira’s art represents innovations in multi-dimensional mixed media which have come to represent global causes at top international summits. 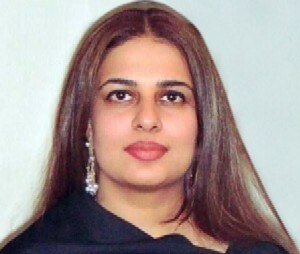 Namira's selection as Founder Astronaut of Sir Richard Branson's [Chairman Virgin Group’s] Virgin Galactic, [the world's first space-liner] made her the first Pakistani and the first UAE resident to potentially go to space in 2009. After being personally introduced to the international press by Sir Richard Branson in early 2006, Namira was officially launched by the Ministry of Information and Broadcasting in Pakistan as the first Pakistani Astronaut. With unprecedented media support, she became an international role model for the women of Pakistan, South Asia and the Gulf encouraging them to excel in all spheres of life. Namira’s most recent accomplishment is skiving from Mount Everest at 29,480 feet, which made her not only the first Pakistani, but also the first Asian to do so from the third pole of the world. Being her first skydive ever, this was a tandem one. 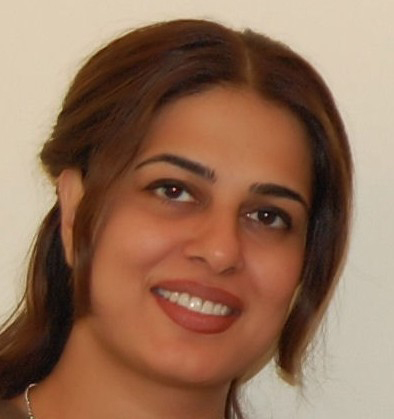 Namira’s other record breaking adventures include her peace expedition to the South Pole, when she became the first Pakistani to have reached 90 degrees South on 10th January, 2008. Not long ago, on 21st April, 2007, she brought laurels to the nation by becoming the first Pakistani at the North Pole in her capacity as Pakistan’s Honourary Ambassador of Tourism. During her polar expeditions, she proudly hoisted the National flag at the pinnacle of our world. Moreover on both Poles, Namira also hoisted her universal peace flag, ´´Peace Making with Nation Souls.´´ Through these unique peace missions to the top and bottom of the world, Namira generated positive press internationally. Moreover, she also became the first female at the North and South poles from her two adopted countries, Monaco and the UAE. Above all, Namira has touched the three poles of the world in her own unique way, breaking boundaries as the first Pakistani and first Asian. Namira’s creations have been exhibited and viewed only at top international humanitarian summits at the United Nations, UNESCO and during the former historic SAARC Summit in Pakistan. As supporting events to high profile meets, her art has regularly voiced peace and goodwill messages before world leaders. To this end, Namira created a specialized line of musical art objects under the theme ‘PEACE-MAKING with NATION-SOULS’ containing built-in songs in her own voice and built-in messages in the voices of distinguished humanitarian personalities. The same were first unveiled at the United Nations in New York as a supporting event to the UN General Assembly in 2002. For the entire month that followed, the UN secretariat lobby buzzed with voices of Kofi Annan, Nelson Mandela, Mother Teresa, HSH Prince Albert II of Monaco etc., from within Namira’s musical art objects. At UNESCO, her exhibition featured a special series of mix media sculptures representing the empowered women of the world [all regions], V/S the un-empowered woman of South Asia. The philosophical foundation of her work rests in her private label, “A•SOUL•AFFAIR de Monaco” of which she is the founder and creator. At the heart of her art, is thus the soul and her philosophies are deeply rooted in a strong value system and universal ethics. A•SOUL•AFFAIR is Namira’s exclusive line of jewellery, decorative arts and fashion accessories registered in Monaco. This line is of historic significance since Namira has brought her unique Eastern signature to museum quality European materials, like, Venetian glass, French and German Porcelain etc. All of her themes are inspired by the densely quilted night sky. Her unique collectibles have long served as unique gifts to VVIPs and royal family members. Namira’s specialization at Columbia University was Management of Innovation and Entrepreneurship. She has also pursued programmes at the London School of Economics and Political Science, Parsons School of Design and the Fashion Institute of Technology, New York. 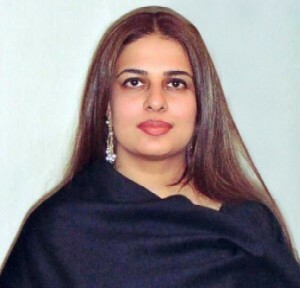 In 1993 Namira became the Founding President of AIESEC in Pakistan, the largest student run non-profit organization of the world, which promotes peace and cooperation through corporate and cultural exchange programs. This NGO created opportunities for several foreign interns to work in Pakistan and resulted in placing several Pakistanis in permanent jobs in the US, Europe and the far East. [AIESEC = French Acronym for the International Association of Students in Economics and Business Management]. 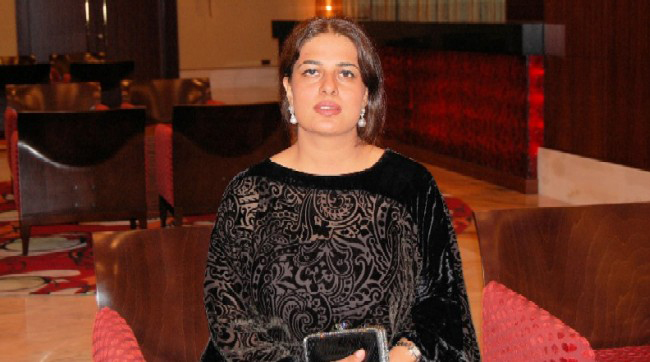 Namira will be publishing her first book of English poetry soon, which is inspired by Urdu ghazals. This book will also be presented in the form of musical videos. 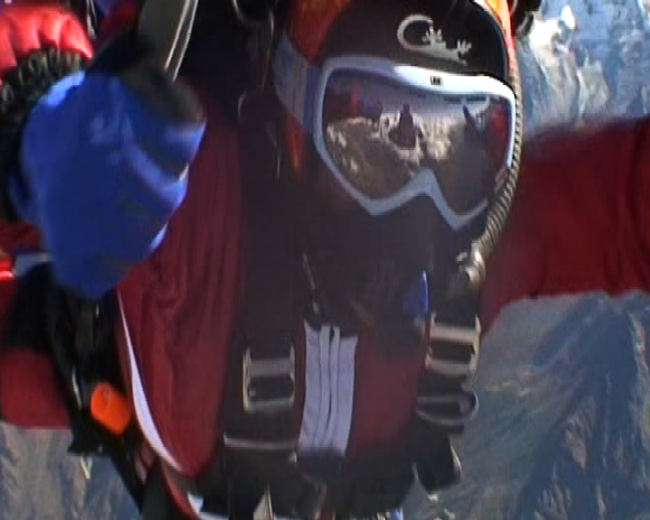 FIRST EVEREST SKYDIVE 2008: First Asian and First Woman Residing in the Middle East and first resident of Monaco to skydive the Everest. SUB-ORBITAL SPACEFLIGHT TRAINING at the world´s largest Centrifuge. Qualified to go to sub-orbital space, October 2007. HONOURARY AMBASSADOR OF PAKISTAN FOR TOURISM, FOR “VISIT PAKISTAN YEAR 2007.” Appointed October 2006. 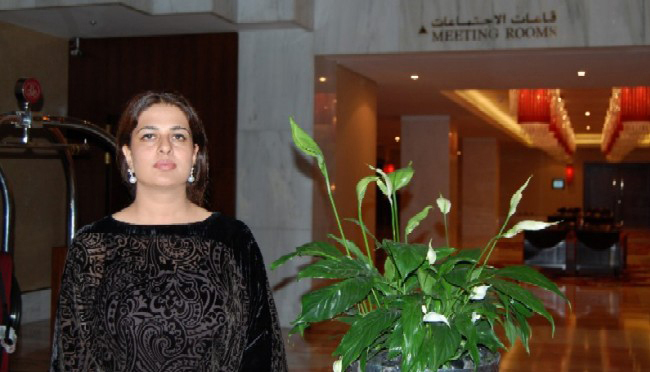 FIRST PAKISTANI NATIONAL AND FIRST WOMAN FROM THE UAE AND MONACO AT THE SOUTH POLE, Hoisted the national flags of Pakistan, UAE, Monaco, the EU and a universal Peace flag at the South Pole on 10th January 2008. FIRST PAKISTANI NATIONAL AND FIRST WOMAN FROM THE UAE AND MONACO AT THE NORTH POLE, Hoisted the national flags of Pakistan, UAE, Monaco, the EU and a universal Peace flag at the North Pole on 21st April, 2007. FIRST FEMALE ASTRONAUT FROM THE UAE – Launched by Sir Richard Branson, Chairman, Virgin Group in Dubai, March 2006. FIRST PAKISTANI ASTRONAUT- Launched by the Ministry of Information and Broadcasting in Pakistan, August 2006. UAE - PAKISTAN EARTH-QUAKE SOLIDARITY DAY – FEBRUARY 2006 Exclusive Presentation of a Gift on behalf of the People of Pakistan, a collectible from A●SOUL●AFFAIR de Monaco to HH SHEIKH NAHYAN BIN MUBARAK AL NAHYAN, Minister of Higher Education & Scientific Research – UAE. UNDER THE AUSPICES OF THE EMBASSY OF PAKISTAN TO THE UAE AND UNDER THE PATRONAGE. DECEMBER 29TH 2003-JANUARY 6TH 2004. Historic 12th SAARC [South Asian Association for Regional Cooperation] SUMMIT PAKISTAN. DUBAI JAGJIT SINGH SINGING CONTEST: WINNER OF 3RD PRIZE - OCTOBER 2003. Contest judged by Jagjit and Chitra Singh, world renowned Indian GHAZAL singers. PEACE-MAKING WITH NATION-SOULS: An Innovative Solo Exhibition of Musical and Vocal Art Objects by Namira Salim. Official supporting event to the UN General Assembly Special Session on Children. Under the auspices of the Permanent Mission of Pakistan to the UN. An Audio-Visual digital exhibition of revolving, jewelled art objects. PEACE & SOUL: Exhibition of Arts and Collectibles by Namira Salim. During the Executive Board Meeting of UNESCO, Inaugurated by the Chairwoman of the Executive Board, Assistant Director General Culture and Head of Pakistan Delegation to UNESCO. 16. UNDER THE PATRONAGE OF HIS HIGHNESS SHEIKH AHMED BIN SAEED AL MAKTOUM: Member of the ruling family of Dubai, Chairman Emirates Group & President Dubai Civil Aviation. PURELY•A•SOUL•AFFAIR - DUBAI, SEPTEMBER 2000. 17. UNVEILING OF 1ST MUSICAL AUDIO-VISUAL ART OBJECT BY JAGJIT SINGH: U.K. SEPTEMBER 1999. Inspired by the [ghazal] music of Jagjit & Chitra Singh. Ghazal recomposed by Kinnar K. Seen and sung by Namira Salim. Originally sung by Chitra Singh. 19. PADI CERTIFIED SCUBA DIVER and a STUDENT PILOT. 20. Master of international Affairs from COLUMBIA UNIVERSITY, New York [Ivy League] and BBA in International Business Hofstra University, New York. 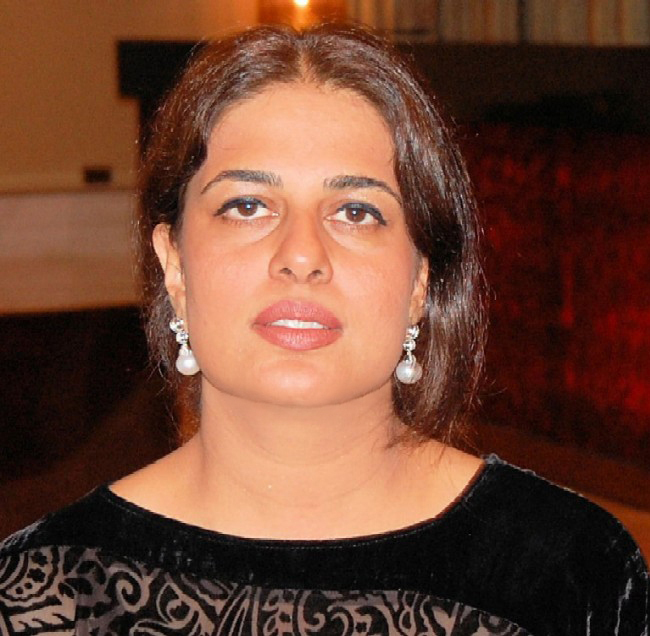 Namira Salim continues to inspire and empower the women of the UAE and Pakistan. Her daring adventures have created positive press and have encouraged women to excel in all fields of life. Namira has recently been nominated for the prestigious ´´Emirates Woman of the Year Award 2008´´ under the sports category. To vote for her to receive this award please send an email to emirateswoman@motivate.ae. You must enter ´´Namira Salim´´ in the subject box and include your name and contact details in the email.